A view from the cycle path: The Aussies are coming, the Aussies are coming ! 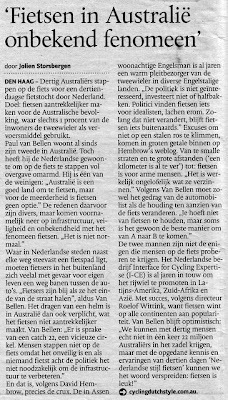 A diverse group of over 30 Australians, led by Paul van Bellen of Gazelle Bicycles in Australia, have just started an ambitious tour around the Netherlands, looking at infrastructure as well as other things while they're here and hoping to take some of the knowledge home with them. "Cycling is an unknown phenomena in Australia"
They're also making headlines. 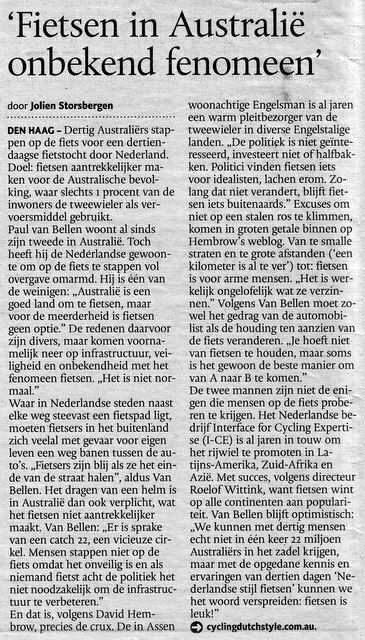 This article was syndicated around the Dutch newspapers today. We're meeting the group on Friday and taking them on what will be a condensed one-day study tour in this area, showing the infrastructure and how it serves local people by making everyday cycling a pleasant, convenient and relaxing experience for everyone. In September we're organising another public Study Tour in Assen. This will follow the usual three day route, so we'll have a bit more time to look at things. If you're interested, book now. Update 15th May. The Study Tour was successful on Friday. A further blog post has been made about it. Good to hear they are in safe hands. I hope our decision makers listen to them on their return. I think it's great what you are doing, cycling is good for everybody and for the environment. Lots of succes! Dave, are the bikes rented ones, or they brought their own? Michael, due to Paul's links to Gazelle, I think some of them are buying bikes which they will then take back to Australia. From all of us on the Cycle Tour I would like to thank you, David and Judy, for an excellent one-day tour of Assen and its surrounds. We would also like to say a big thank you too to Mark Wagenbuur who travelled far to be with us today. We all thoroughly enjoyed the day (even the tired ones!) and have been talking about it non-stop since we parted ways. It is always a pleasure to have passionate people sharing their knowledge. To anyone considering taking such a tour you won't regret it. Thank you so much Judy, David and Mark for making our day so memorable and enjoyable. I can speak for everyone who came on the day that the group left Assen with a great deal of knowledge and inspiration from what is a great example of a town that has excelled in smart urban planning and happy community spirit. Hopefully lessons learnt from our day can be manifested in communities closer to our homes. All the best and cycle safe! Great idea. Fun video too! Those tunnels! But I particularly like that they found something to eat in the end. You never know what chance might bring you on a bicycle.